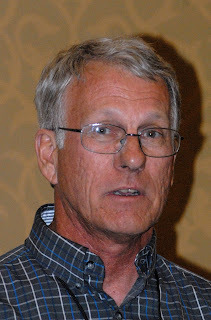 Parry Klassen is Executive Director and Board Chairman for the East San Joaquin Water Quality Coalition (ESJWQC), a watershed coalition with 3,950 grower members farming 706,336 acres in Stanislaus, Merced, Madera, Tuolumne and Mariposa Counties. Since 2003, Klassen has led coalition efforts to develop approaches for solving water quality problems from agriculture in the region. Klassen noted that there are about 180,000 acres of unrepresented growers in the region he oversees. “These growers will need to sign up for an individual permit or the regional water board will round them up over the next six months with threats of fines,” he said. “We operate with a group permit, representing our growers' interests to the State Water Board,” Klassen said. “We are more in the line of a cooperative because this group permit has specific things that are not covered by a commodity group or organization; there are simply no entities out there to do this. We fill this void. We represent the interests of our members to the State Water Board." Klassen said, "The third party approach of the coalition is good in that it has the flexibility to respond to what we find and then work on those problems. We can adjust solutions to meet local needs and provide the information to the Water Board to aid in their decision-making." The ESJWQC was the first group in the state to get waste discharge requirements (WDR), and were the first to go to battle with the State Water Board regarding mandates on surface and ground water regulations. Since 2004, the ESJWQC has spent about $50 million on surface water monitoring, negotiating with the State Water Board, writing reports and doing outreach. “This has all come out of the growers’ pockets because there is no grant money,” said Klassen, who also farms peaches in Fresno County. And expanded story on the ESJWQC will appear in the September 2013 issue of Pacific Nut Producer magazine.